Midfielder Rory Hale is enjoying life this season at Seaview. Rory Hale concedes that Crusaders have put all their eggs into the Irish Cup basket. The talented midfielder would love to cap of his debut season with the Shore Road men with two cup winners medals. After seeing off Linfield in the County Antrim Shield final a few weeks ago, Hale now wants to add a Tennent’s Irish Cup winners medal to his collection. “It would be a brilliant start to my Crusaders career,” he stated. “The County Antrim Shield is already in the bank and that was my first medal with the Crues and I’m hoping I can win my second medal with the Irish Cup. When Stephen Baxter’s men defeated soon to be crowned Premiership champions Linfield in the sixth round, they then focused everything on trying to book their place in the May final. “We have put all our eggs in one basket for the last couple of months now,” he explained. “Ever since we beat Linfield we have really went all out to try and win. The Irish Cup ever since that win has been our main focus and Saturday is a big game for us and I’m looking forward to it. The ex-Derry City man, who has been in sparkling form for the Crues this season, knows it’s going to be another tough encounter against the cup holders. “To be honest I don’t think either side would have wanted this tie,” he added. “We had a really tough but good game against them a few weeks ago when we beat them 4-2 at home. We did really well that day and we are starting to get a few boys back from injury and the suspensions are starting to clear up, so we are getting back to a full squad and because of that I’m sure we’ll be putting on a big performance on Saturday. Steven Crawford: Who will make it through to the Irish Cup final? Tomorrow the 22-year-old will come up against his old Brandywell team-mate Ben Doherty and that midfield tussle is something he can’t wait to get started. Hale admits, that he’ll be looking for another early tackle on his good friend tomorrow, and wants to make sure that he’ll have the bragging rights at the final whistle. “I came up against Ben a couple of weeks ago and I hit him with a really good tackle early on,” he joked. “I get on really well with Ben and I have ever since I joined Derry, even now I’m still in contact with him, so I’m looking forward to coming up against him again. “Ben is a really, really good player and he has been doing well at Coleraine. 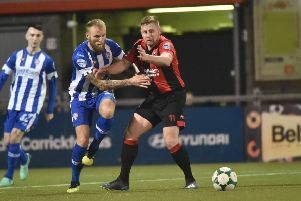 “He seems to have kicked on since he has moved into the Irish League, starting with Glenavon, where he was flying and now at Coleraine I would say he has been their best player since he has signed.